It’s not hard to see that a lot here at Microfluidic Future focuses on the medical applications of microfluidics, but that doesn’t mean that I’m not interested in other ways the technology can be used. I love to see novel applications of microfluidics because progress for anyone is progress for everyone. That brings me to today’s post on the RootChip. 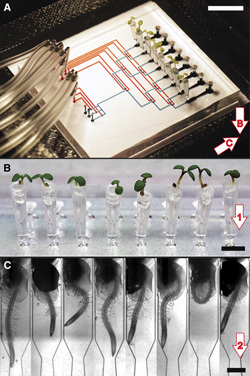 If the name isn’t a total give away, I recently came across an article that uses a microfluidic chip to study the roots of plants. In the article, “The RootChip: An Integrated Microfluidic Chip for Plant Science” by Stephen Quake and other researchers from Stanford University, a device is developed to study the roots of Arabidopsis thaliana. The current RootChip handles 8 seedlings with independent control. After previous germination, tips containing the seedlings are inserted. The roots can readily be analyzed and observed in the flow chamber. Arabidopsis thaliana has been extensively studied and is akin to the drosophila or zebrafish. It’s not easy to study the roots of a plant because they are sensitive to dehydration and physical damage, which could occur with mounting. Ideally they would be observed as close to in vivo as possible. The authors set out to study the Arabidopsis roots in parallel perfusion chambers, allowing many seedlings to be studied at once. To prove their concept, they used roots “expressing a genetically encoded fluorescence sensor for Glc and Gal.” This would allow them to non-invasively detect the Glc and Gal metabolite levels in real time. Before introduction to the RootChip, Arabidopsis seeds are germinated in agar medium filled micropipette tips. This germination prior to attachment to the RootChip allows the roots to be screened for adequate growth and desired properties. After 5 days of germination, the tips are mounted on the RootChip. The roots continue to grow into the RootChip’s observation chambers which are filled with liquid medium. The microfluidic channel that leads from the inserted tip transitions from vertical to horizontal and the root typically aligns with the direction of flow. The entire RootChip is encased in a chip carrier that includes water reservoirs to ensure that proper humidity is maintained throughout the study. Each seedling in the RootChip feeds into its own flow chamber. 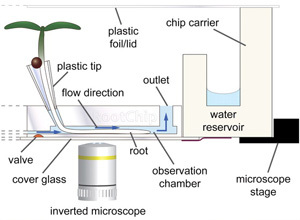 The entire RootChip can be mounted on a microscope and is enclosed to maintain humidity. The roots were subjected to pulses of medium spiked with either Glc or Gal. Geneticaly encoded fluorescence sensors allowed for cytosolic Glc and Gal measurements, and the authors recorded reproducible elevations in the roots’ corresponding sugar concentrations. Gal is a well-known root growth inhibitor and the authors examined its effect while perfusing the roots with Gal for a long period of time. They observed darkening of the tissue and a loss of normal cytosolic signal distribution, indicating cell death and tissue alterations due to the long Gal exposure. The authors also noticed swelling epidermal cells, which would indicate a defect in the integrity of the cell wall. I don’t have any experience in plant study, but this device seems very promising, and I’m excited to see what it leads to in both plant and biomedical microfluidic research. While the use of Gal and Glc may be exciting to some, it is really irrelevant and could be replaced by any other fluorescent markers. Let’s look instead at the capabilities that the RootChip demonstrated. First, the chip allowed the researchers to process 8 seedlings in parallel, which is always a timesaver! The authors noted that in its current configuration, 8 seedlings could be used, but modifications to the design could enable them to use more than 30 seedlings. The design also saves time since the seeds can begin germination externally before introduction to the chip. This allows researchers to select ‘high-achieving’ seedlings, and they won’t have wasted space on a dud. Moving onto the experiment-enabling design of the chip, we can see that each perfusion chamber is independent and gives the user total control over several simultaneous experiments. This by itself is fine: You could use the RootChip to control your experiments and then use some other means to analyze the results. But with bright-field microscopy, the roots can be observed during and after the experiment in their ‘natural’ environment. I said before that I’m not an expert on plants, so I really don’t know the extent to which roots can be at least partially transparent. The transparency of the root and the bright-field microscopy allowed them to track the fluorescently-labeled metabolite activity, the swelling of the cells and the darkening of the root from death. What else could you observe about a root in the RootChip? And what else besides a root could you observe in the perfusion chamber? I guess you could look at some parasites like a tapeworm and watch them grow and respond to environmental changes. But would you really want to? I have a 100 yard rule about how close I let tapeworms get to my insides. You could say that valves in microfluidics (or microvalves) are like traffic lights that control flow along microfluidic channels. But I’d say that they’re more like police barricades, stopping anyone they want, wherever they want. The sole purpose of microvalves is to control flow within a microfluidics device, allowing them to become very complex and more automated. Without microvalves, all reactions and mixing must occur in the same space, unless they were premixed elsewhere, which might just eliminate the advantage of microfluidics. Every microvalve that has ever existed seems to be covered in “A review of microvalves” by Kwang W Oh and Chong H Ahn from the Journal of Micromechanics and Microengineering. I’ll be covering three of the valves mentioned, but feel free to check out all the other microvalves that didn’t make the cut. A companion paper for this post, “Incorporation of prefabricated screw, pneumatic, and solenoid valves into microfluidic devices” by George M Whitesides et al. , featured in Lab on a Chip, describes a way to prefabricate these three valves so that they can easily be added to existing lab-on-a-chips. You guessed it, solenoid microvalves are based on…solenoids! A solenoid is a coil of wire wound in a helix, like a compressed spring. I won’t go into the physics behind it, but a magnetic field is created by passing current through the solenoid. If you put a metallic object within the coil and vary the current, you could move the object. This is the idea behind solenoid microvalves. A solenoid microvalve is simply a solenoid with an actuator inside of it. The actuator is situated above the channel of a microfluidic device and pushes down on the ceiling of the channel to collapse it and obstruct its flow. In this manner, the solenoid microvalve requires an elastomeric lab-on-a-chip, and is rather bulky. Whitesides’ prefabrication does not involve a dramatic redesign of solenoid microvalves. Instead, he places the same solenoid in PDMS housing, which can accommodate the solenoid’s large footprint. This is another one. You guessed it, microvalves are based on…screws! This is an extremely low tech microvalve that requires little more than a screw. The screw is incorporated into the microfluidic device and deflects the membrane of the channel by twisting it. A ball can be placed beneath the screw to prevent damage to the device. This design is great for lab-on-a-chips that are intended to be disposable or for a low-resource setting. It requires no power, has a small profile (although you need access to screw it manually) and is simple to use. Obviously, it’s not completely automated, but I suppose you could incorporate a small electric screwdriver somewhere. Whitesides’ prefabrication method doesn’t really differ too much from the conventional screw microvalve design. 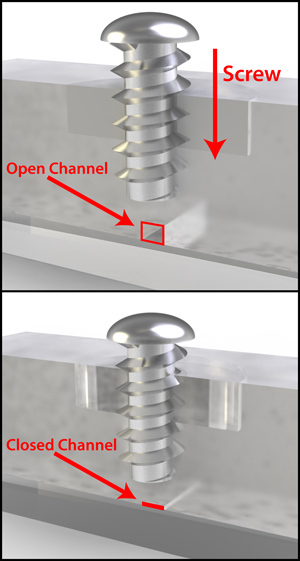 The screw is essentially embedded in a housing which can be joined above an existing microfluidic channel. One of the key advantages argued by Whitesides is that prefabrication regulates the screw microvalves. All the prefabricated screw valves are created in an identical manner, and would require the same degree of rotation to shut off flow. This is important because it may not be possible to see how well the flow is obstructed, resulting in leakage or damage to the channels. Screw valves created by different people at different times may be placed differently. A half-turn of one person’s valve might not properly close the channel, while a half-turn of someone else’s valve might go too far and damage the device. I know it says pneumatic, but these are commonly referred to as Quake Valves, named after Stephen Quake. Quake valves require additional channels, often perpendicular to the targeted microfluidic channels. The additional channels share a thin, common membrane with the targeted channels. When air at the right pressure is applied through the pneumatic channels, the shared membrane is deflected and obstructs the flow of fluid. This completely changed the field of microfluidics since its arrival in 2000, allowing such feats as 400 simultaneous PCR reactions. As cool as these microvalves are, they certainly have their drawbacks. First, they require more planning because you not only need to incorporate an additional layer of pneumatic channels, but you also have to route all your channels so that they don’t overlap where you don’t want them to. A small change in the design of your microfluidic device could require a massive redesign. While the solenoid valve certainly has a large footprint over the lab-on-a-chip due to the large size of the solenoid, the Quake valves only require the inclusion of an additional layer, keeping the area directly around the device cleaner. But this setup requires a tank of pressurized gas near the device, so in reality its footprint isn’t so small. This obviously hinders a device from easily leaving the lab. The pneumatic valves can be controlled electronically, allowing a device consisting of multiple independent valves to become more automatic. For instance, Albert Folch of University of Washington created this video of a Microfluidic Ballet by controlling valves according to the frequency of the music by Dimitri Shostakovich. Whitesides’ prefabrication of Quake valves diverges from the most from the conventional out of all three microvalves shown here. Simply consisting of a chamber attached to an air supply placed over a channel, this method doesn’t require any additional layers of valves. A conventional Quake valve would require an entire redesign of the pneumatic channel layer, while a prefabricated Quake valve can simply be relocated over a new channel. When activated, the chamber presses down on the channel wall and obstructs the flow. We’ve only examined three different microvalves here, and you can see how radically unique they are. As we develop new microfluidic applications and materials, we’ll continually develop novel ways to control the flow. A high concentration of valves indicates greater device design sophistication, but even so, less can be more, and our best solution might just be the simplest one. This is one part of my Microfluidics Beginer’s Guide. Check out the rest of it and keep learning! Do you know what microfluidics is? Do you currently use anything with this technology? We may never know the results of the poll, but I think I'd hear "No" and "What is microfluidics?" Have no fear, because today you’re lucky enough to read my Beginner’s Guide to Microfluidics. Microanalysis is the chemical analysis and identification of small amounts of matter, such as capillary electrophoresis. First developed in the 1960s, it is a method to separate ionic species using their size to charge ratio. Capillary electrophoresis is still used today, showing that microanalysis not only provided needs for microfluidics to meet, but it also provided some techniques. Awareness of chemical and biological warfare escalated after the Cold War, fueling the United States’ Defense Advanced Research Projects Agency (DARPA) to heavily fund microfluidics research in the 1990s. Biodefense remains a major area or research in homeland defense as demonstrated by the recently unveiled microfluidics-based device that detects anthrax or other suspect DNA. The suitcase-sized system recovers cells from a sample and analyzes the DNA in less than an hour, while it currently takes 1 to 3 days in the lab. In the past few decades, genomics activity has progressed quickly and has demanded newer technology to grow even further. Microfluidics had the opportunity to process DNA faster, cheaper and more precisely. Stephen Quake, a professor at Stanford University, has been leading cutting-edge research in sequencing. The ability to sequence DNA in weeks rather than months has allowed him to start a company, Helicos, implementing microfluidic methods. There have been several microfluidic applications for sequencing as researchers and companies race to sequence a human genome for only $1,000. While the three previous “parents” have provided some tools and needs for microfluidics, the final “parent” helped it find its form and substance. Microelectronics was also developing at the time (although it was further along), and people saw a way to manufacture micro-sized structures precisely. Microfluidic components were first made of silicon and glass with microelectronics techniques such as photolithography. Eventually, silicon was replaced by materials with more suitable properties. Silicon is not durable, cheap nor transparent to visible or ultraviolet light. This is important because light is often used to either determine the results of a test, or to or to provide excitation energy. The most popular substitute material has been PDMS (polydimethylsiloxane). PDMS is a soft, transparent elastic polymer that is permeable to carbon dioxide and oxygen, making it useful for housing cells. Other cheaper, alternative materials have also been developed, such as thermoplastics, paper and string. These four parents have given birth to a field that focuses on biochemical and medical applications, and with good reason. While everyone loves small things (I’m sure that micro is sad that it never got its time in the sun before the world became obsessed with nano), there’s more to it than that. A microfluidic device does have a smaller footprint than a huge machine in a lab, but it also uses a lot less fluid too. Why would you make a whole pot of soup just to taste and then dump it down the drain? On the other hand, I would make as little as I could and still taste it. So we can see that microfluidics is beneficial because it uses less costly chemicals and reagents, but it's also attractive due to the physics happening at the micro scale. Now, we’re not talking about leaving the world of classical physics and entering quantum physics, but matter does behave differently, most evidently in the way liquids flow. In fluid mechanics, there are two main types of flow: laminar and turbulent. Turbulent flow is just how it sounds, violent and chaotic. Laminar flow is peaceful, and particles will basically maintain their course without mixing. The state of a flowing liquid is determined by its Reynolds number. This is proportional to the dimensions of the channel and the velocity of the liquid. Slower liquids travelling in narrower channels are more likely to be laminar. This not only makes pretty images like those from Albert Folch’s lab, it gives a new level of control to researchers. Two laminar fluids flowing side-by-side will only slowly mix by diffusion, rather than convection. This allows us to do some clever manipulations, like selectively inserting components to induce mixing in some of the streams in a multi-stream channel. Other techniques exist to create droplets, which allow for controlled mixing, and capillary action is utilized to eliminate the need for pumps. Microfluidics can be incorporated into a lab-on-a-chip which is used as an assay or diagnostic test and replaces its large, costly full-size lab counterpart. This has three basic components, a sample, a process and a validation method. For example, you might input a fluid such as saliva or blood to be analyzed. Next, you’ll have to process this blood mechanically or chemically. This may mean mixing it or applying filters to isolate what you want, and then introducing a possible chemical reaction. Even so, what good is this reaction if you can’t tell if it happened? You may be able to see a change in color, or look at it under a fluorescent microscope. These three components can be fulfilled in dozens of ways to create whichever test you so desire. You must be saying to yourself, “Wow! What a technology! So why haven’t I heard more about this if it can do so many magical things?” Well, space travel is cool too, but when was the last time that you were out in space? Microfluidics just hasn’t made its breakthrough to the rest of us consumers. We can create some pretty cool applications with it, but how often can those prototypes be easily mass-produced? And how easy will they be able to use and troubleshoot and fix? Both concerns are even more important for point-of-care applications. Point-of-care refers to a medical application that is being used right where the caregiver meets the patient. In the developed world, this means that your samples don’t have to be sent to a lab somewhere to be processed, and in the developing world, this gives access to life-saving diagnostics that are normally too expensive to purchase and operate. More importantly, the quick response time of the devices would provide results to people who have travelled to a far-away clinic and need to return home again. No matter how elegant or complex a microfluidic device is, it must be easy and cheap to make, simple to use and durable. Now, I don’t want it to seem like there are no companies producing microfluidics-based technologies. Some relevant ones are Helicos, Fluidigm, Claros Diagnostics, MicroFluidic Systems, Affymetrix and Advanced Liquid Logic. If you want to see a more complete list, check out the one at FluidicMems. I hope that I’ve helped you to understand the basics of microfluidics, and you can continue to learn about the field on this site. Oh, and if you were wondering how long it will be until you can get your hands on some microfluidic tech, you probably already have: your inkjet printhead incorporates microfluidics! This is one part of my Microfluidics Beginner’s Guide. Check out the rest of it and keep learning!